WARNING: This is a preview of Dice of Pirates. All components and rules are prototype and subject to change. For a two-player game, each player starts with five gold coins, and all other coins are set aside while raid tokens are placed nearby. In 3-6 player games, the first player starts with one coin while all other players start with two, and the gold coins and raid tokens are placed within easy reach. Each player's turn consists of a Roll phase, Ship phase, and Raid phase. In the Roll phase, the player rolls the dice to begin their turn, and any swords and krakens are set aside. Any coin dice can either be re-rolled or set aside. 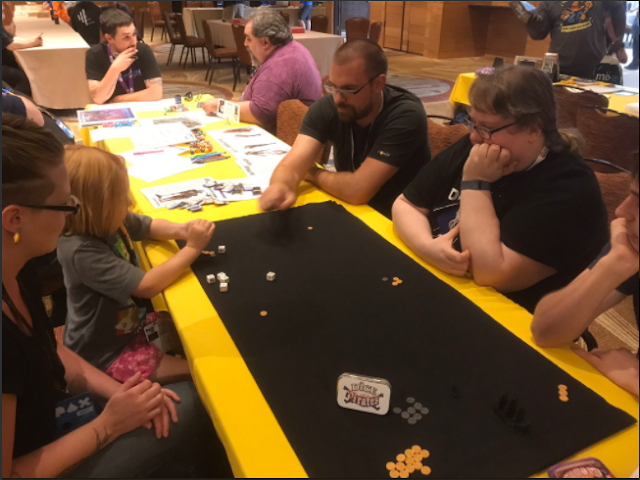 If the player has rolled any ships, the turn progresses to the Ship phase, and they hand all ship dice to an opponent, who rolls the dice. 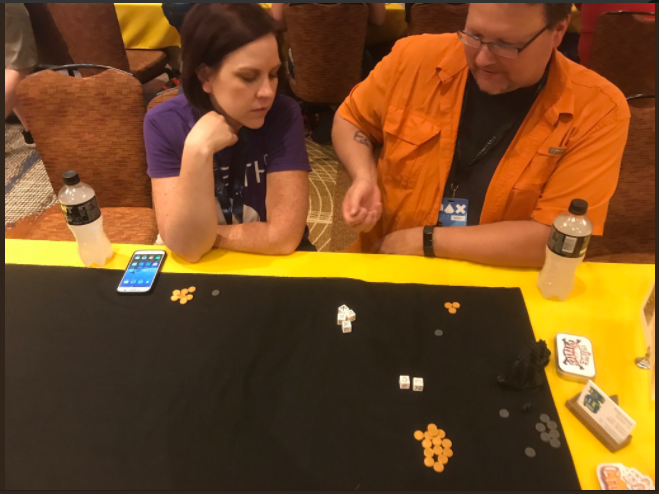 If a coin is rolled, the player can choose to put the die on any face, or take a raid token and return the die to the active player. Any swords rolled go back to the active player to be used in their raid, ships return to the active player to be re-rolled, and krakens are set aside. All components in pictures are prototype. Raid tokens can be cashed in by either a defending or attacking player as a coin die, guaranteeing them a gold coin from their opponent. Players can use as many raid tokens per raid as they like, and the tokens are played before combat rolling begins. If a player has three or more kraken dice at any point before the Raid phase begins, their turn ends immediately. A player with three or more swords can choose to enter the Raid phase after the end of the Ship phase. In the Raid phase, the player chooses an opponent to attack in hopes of stealing their gold coins. The active player rolls only the dice with swords from the Ship and Roll phases; all other dice are set aside. If a coin is rolled, the raid was a success and one gold coin will be taken per coin die rolled at the end of the phase. If a kraken is rolled, the die immediately leaves play and is set aside. If a sword is rolled, the active player re-rolls the die, but if a ship is rolled, the defending opponent rolls the die instead. They then follow the same rules as the active player for the dice they roll. After the Raid phase ends, one gold coin per coin die is paid to its roller, and the next player's turn can begin. 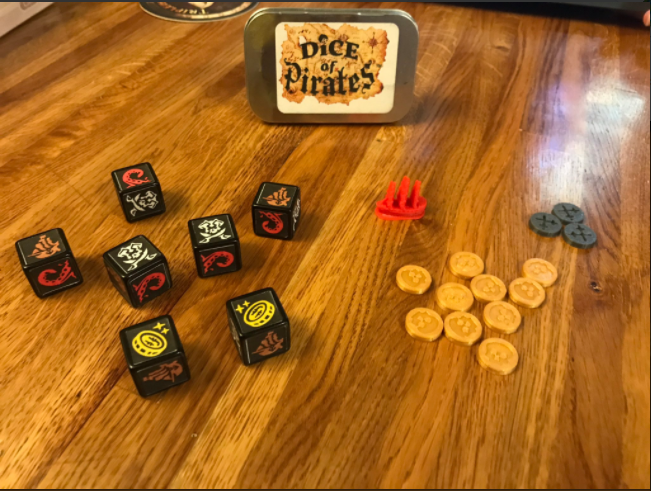 For their latest dice roller, Thing 12 Games plunged headfirst into the pirate theme, with coin faces changed, new tokens added, and all-new dice art. For the advanced win condition, you also must take hold of a small ship and keep control of it to win the game. The mechanics are very similar to those in Dice of Crowns, with dice rolling and doling out dice to inconvenience other players being the main strategic elements. Compared to Dice of Crowns, game play is much slower because the Raid phase adds a lot of time to each player's turn. The adaptation of the game certainly fit the theme but lacked the same element of strategy and simplicity achieved in the original. Raid phases, however, do allow both attacking and defending opponents to potentially earn gold coins in the same turn, which is an interesting new mechanic. The artwork is definitely evocative of the pirate lifestyle, with two swords crossed in battle, a kraken tentacle, and a pirate ship added to the dice faces. Additionally, the skulls and crossbones on the gold coins made them really feel like pirate loot. In this prototype, all pieces were 3D-printed, which unfortunately led to some off-balance dice. The same embossed dice as seen in Dice of Crowns will be used for final production, eliminating this problem for Kickstarter backers. The theme was well-conveyed throughout the game, and rule changes made it unique to Dice of Crowns. More complex rules made the game slower and more confusing. In particular, my play test group couldn't understand why swords would be returned to the active player during the Roll and Ship phases. With some minor tweaks to the rules, this game will definitely be a successful and unique twist on Dice of Crowns. Lovers of dice-rollers and fans of Thing 12 Games' Dice of Crowns will enjoy this game. 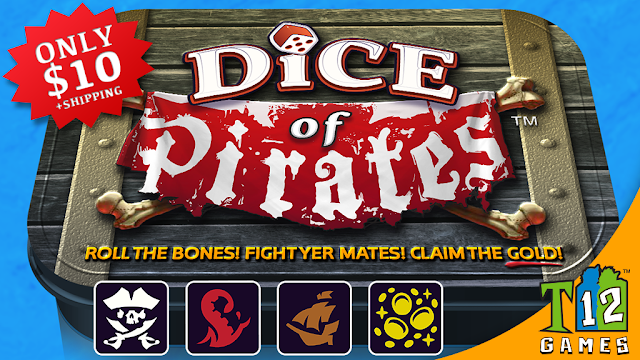 I am giving Dice of Pirates 5 out of 10 super meeples. 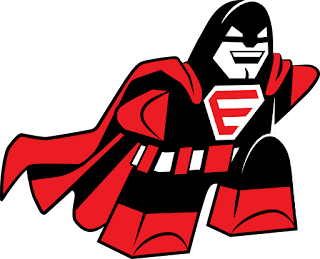 Coming to KICKSTARTER September 18, 2017.